Huge Ahwazi demonstration on the ninth anniversary of the Ahwaz popular uprising of April 2005 before the European Parliament in Brussels on Wednesday, Apr 16th, 2014 condemns the never- ending crackdown perpetrating against Ahwazi Arabs people in the south and south west of Iran. The member of EU’s Ahwazi community held this demonstration to voice out the suffocated voice of Ahwazi Arabs that are under the worst oppression of Iran regimes since 1925 till today. 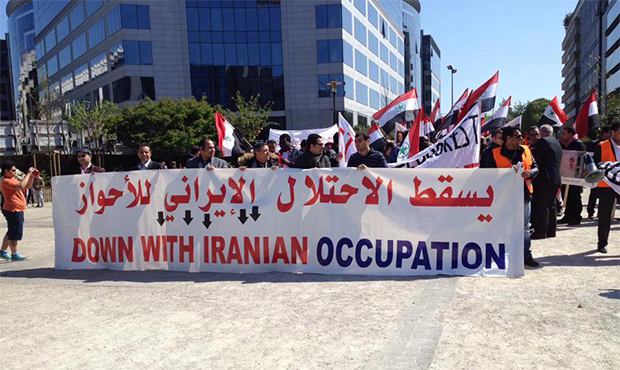 The protesters also condemned Iranian occupation of their land. To be noted that non- Persian communities such as Kurdish group participated in this demonstration to slam Iran regime over its hideous crimes in murdering non-Persian people by the ongoing machine of execution. In solidarity with demonstration organized by the Ahwazi Arab activists on ninth memory of April 15 Uprising in different Ahwazi regions, the Iranian authorities have launched a Precautionary wide arbitrary arrests in Ahwaz and arrested dozens of political and civil activists during last week. On April 15, 2005, thousands of Ahwazis protested against Iran’s ethnic cleansing policies in Ahwaz. The peaceful intifada or uprising was very successful at first, but then the vampire regime sent in security forces and at least 160 people were killed, and thousands were arrested. The horrific part of it was that many dead bodies had to be retrieved from the rivers where they had been thrown. Many were convicted of “waging war against God” and were executed. The last cases were the execution of Hashem Shabbani and Hadi Rashdi who were both high school teachers. Over the next year, more than 28,000 people were arrested in the predominantly-Arab Ahwaz region.